Click here for ERCM's performance tuning guide. To place an order click here or to discuss options send an email to . We take paypal! You will receive a confirmation email with payment details after submitting your order. Any additional charges such as shipping or insurance are not included in the prices listed below. This mod is exclusively for the competitive racer. Each engine is analyzed and modified to increase performance with little to no loss in run times. Each port is worked to increase it's effectiveness in supplying air/fuel to the cylinder. Another benefit is a very smooth power-band with no lack in bottom end while achieving a substantial top end. These modifications have been proven by ERCM's team drivers as well as customers over and over. This modification is for the more experienced tuners. The profiles are pushed to the limit resulting in an extremely powerful engine that will blow the competition away. The engine is fully modified to produce ground pounding acceleration and rpm, no aspect is overlooked. Please contact me for more information if you are interested in this type of modification. I was looking to upgrade the motor in my HPI Savage and after some research decided to contact Extreme RC Mods. After talking with Robin my mind was made up. What an honest down to earth guy he is. He answered every question and addressed all of my concerns. I opted for the Extreme Mod on a Picco .28 and after one look at his big block end bleed pipe, I had to have one of those also. When they arrived I think I just stared at the pipe for the longest time. It's definitely a piece of art. The workmanship is second to none. From the moment the ERCM modded picco .28 lit you could tell that this combination was something special. What a difference from the stock HPI 4.6. The intimidating super crisp throttle response and tight cackling exhaust note definitely stands out from the crowd. Driving my truck now can be explained as a white knuckle experience. I couldn't be more pleased. Following the purchase Robin remained in touch and provided guidance during break-in and tuning expertise afterward. Thank you Robin, you are the epitome of customer service. I now have the Extreme RC Mods sticker on the rear of the truck, because that's the view everyone sees. We decided to have Robin tune a few motors for us for an upcoming event. Robin was not a total stranger to me, I was introduced to him by a mutual friend. From the very first time we spoke, I was left with the impression that he knew what he was talking about. After a few phone calls, and lots of questions (Robin really needs to know what you are going to do with the motor), we decided to ship away eight motors. The timeline was tight, but Robin got them done in time for us. And of course, there were phone calls along the way letting me know the progress. So far, so good. Right from the first tank of fuel, these motors felt different. They were easier to start and would literally idle for minutes on end. As break-in went on the motors just kept getting better and better, improving up to and throughout the race event. I have never felt so confident in how a motor ran before. On behalf of Team High Torque, thank you. "The magic that Robin at Extreme R/C Mods put into my motor helped me to my first ever 1st Place finish in nitro racing (Sportsman A Main). The motor ran flawless all weekend without a flame out and held its tune better than any other motor I have previously owned." "And again Robin from Extreme RC Mods "WOW" the touch that he put on these engines was amazing, and for him to come and watch and hang out and answer any question for 4 day's say's something about not only him but his commitment to his work and others, he hasn't seen the last of Erker's engines." "The motors from Extreme rc mods proved more then powerful. Often overpowering our driving abilities. They ran flawlessly all weekend." "I was a little sceptical about a motor mod as I like how the stock Picco engines run, and don't trust many people with my motors. I was talked into it by Dan and all I can say is thank you. There was not one truck that I could not run down on the straight with Robin's engine mods, other than his other engines in my Team Mates trucks. And Robin's commitment to quality and dedication to his motors shined through after my air filter came off, he was as upset as I was... he then took my motor and cleaned it out, and inspected it and gave it a thumbs up, thank you Robin for the most powerful easiest to tune and start motor I have ever had. And of course the best customer service I have ever seen." 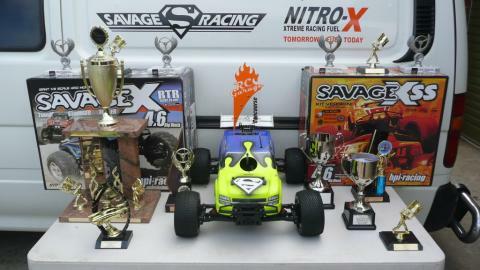 "The motors from Extreme RC Mods ran wicked hard all weekend. And how cool was it that Robin was there to help us all weekend? He even took T-Man's motor home Saturday night to disassemble, clean, inspect and reassemble after the air filter came off. Great guy, great motors, great service." Robin aka Pure Nitro and his engine modification are both nothing short of amazing. I couriered my Picco P3 .28 direct from Tower Hobbies straight to Robin. He kept me up to date with every step as it happened and was great to communicate with. He even picked up that in the package with the engine I had purchased the incorrect plug and supplied the correct plug so that I didn't have to mess around once I got the engine - great stuff. The engine showed up via courier here in NZ a short while later in perfect condition. This engine has power on tap and pulls right through the rev range (using an OFNA 086 pipe). I'm running an IRC front & rear extended chassis with an OFNA 250cc fuel tank up front with the battery box & pack sitting upfront of the axles. The stock K4.6 was good although it couldn't lift the front wheels off the ground because of the weight distribution. Pure's modded picco will get the front wheels up pretty much on demand - I have to feather the throttle depending on the surface! I'm Really stoked with this modded engine and there's followup support available should I need it. I will definitely be going back to Robin should I require any other motors to be modded. This engine is amazing. I was curious as to what a modded engine would be like to run and own, and I can now happily say that it is worth every penny, especially by a modder as talented as Robin. It absolutely screams, I snapped two dogbones like twigs in a single bash session. The RPMs are incredible, I lowered the gearing and my savage still drives faster than ever, absolutely killing all my other RCs and my friend's. Funnily enough, and something that doesn't get talked about much, and my favorite part is that it can idle forever without loading up on oil. Instant power from sitting at idle for minutes on end. Thats what I call an engine! It sounds amazing too, people have commented just on the sound! I love my engine, thanks Robin! I sent Robin my Picco .28 for some modding after talking with him quite a bit about rc in general. As soon as I found out he was going to do this as a business, not just for friends, I couldn't wait. People who know me know I don't give unearned compliments. I'm a pretty harsh critic. I have had engines modded by other modders (STS .30 and Picco .26). I notice more pulling power from Robins modded engine vs. stock then I did with the other engines. The man's got skills! I'm very happy with his work and will send him all of my modding business from now on. I would suggest him first to anybody. I would like to thank Robin for the wonderful work he did on my HPI Savage K4.6 engine that he modified for me, from the time he was recommended to me he has gone well and truly beyond to help me with my engine & advice. I emailed Robin and spoke to him on the phone where he gave me the best advice ever, I sent my engine to him in Canada from Australia where he did his magic for me, keeping me informed with emails while the work was being done, Then he ran the motor in for me and shipped it back to Australia where I fitted it into my Flm extended chassis racing savage ready for racing. From the very first time I started the engine the motor was a true animal, more power than I thought I could handle and the motor ran so cool I was totally amazed, the more I drove the truck I learnt how to control the power that was provided, some gear changes and setting up my 3 speed gear box followed. The racing begins and as a pretty new racer at my club there where a lot of eyes watching this Hpi savage chasing down club champion revos week after week to a point that the main comment I was getting was "that cant be a savage, they are bashers not racers". Well, with an Extreme RC modded engine, my savage was the one out in front of the field. Now six months down the track I must say I am leading my club championships with one race meeting to go and I have won more than 12 events from club meetings to Monster Truck pro Ams with my modified K4.6 engine much to the amazement of nearly all the racers I have come up against. Thanks to you Robin my RC racing days have been filled with fun and enjoyment from the 1st time I started that engine and my youtube account has had more than 30,000 hits from other savage lovers watching all my races and fun sessions. ERCM are pleased to announce that Sam won the Club Championship! Robin helped me to purchase a brand new mill and pipe and started modding. No need to explain the great communication with him as already said from others. He is also your consultant through out the process and even after, if you like. Robin's work is precise engineering. Detail work is done for perfection. When I first fired up the mill I was amazed by the sound, like rapid combustion going on in there. It just screams. Wow! After the engine opened up I felt so much power at a low temperature and at rich settings, now that's brilliant. Idling is balanced throughout. The torque is brutal, it just pulls like no other mill I have owned. Does wheelies with no effort, its crazy power. Its robust force gets my heartbeat rate higher. I'm very impressed. Maybe the fastest savage in my country, Malaysia. Robin, you are indeed gifted in this field, keep it up buddy! Search no other for a modder.. I had heard of Robin and ERCM a while back from the owner of the local hobby shop here in Lloydminster. After a couple emails and then a few conversations over the telephone, I sent Robin a brand new Traxxas 3.3 for him to work his magic on. From the very first pull of the pullstart, I knew this engine was different as it almost started on the first pull to my amazement (I have "broke-in" numerous other engines and never had one start this easily). The second pull it started immediately and idled perfectly (this seems to be a common theme with Robin's engines). Even the sound at idle lets you know that this is no ordinary engine and when you lay into it some... WOW... It's obnoxious to say the least. I have just cracked open the second gallon of fuel (30%) and this engine blows the socks off my other stock 3.3. It has even more top end that the 3.3s are already known for, but it also now has tons of power in the lower rpm range to really get my Revo moving in a hurry. Not am I only more than satisfied with the work on my 3.3, I am even more than impressed with the fact that Robin has kept in touch along the entire way. A week barely goes by without either an email or a quick call from Robin asking how it's going. That in itself accounts for a lot. I just want to say a big "Thanks" to Robin... this may have been my first engine I sent you but it definitely will not be the last! I first meet Robin through HPISF and he was nothing but helpful to me, taught me a ton of tricks and gave me help with any question I had. In November I got a motor and pipe from him. A Picco .28 that was drag modded and one of his End Bleed pipes. I cannot put into words just how incredible this combo sounds. It goes a long way to intimidate others before you ever hit the gas. On the track or out bashing nothing can touch the power and speed that Robin manages to pull out of the motors he mods. It makes other trucks look like they are standing still as you fly by them. The customer service and help Robin offers is second to none and is what truely makes your experence with his motors better than any other you will have. Help and advice is always just a phone call or email away. I will be sending every motor I get to him for modding whether it is for a simple stage one work over, race mod for the track or the all out extreme drag mod that makes your jaw hit the floor.